EDINBURG — The county’s new voting machines were tested Monday before being doled out for their first official election. 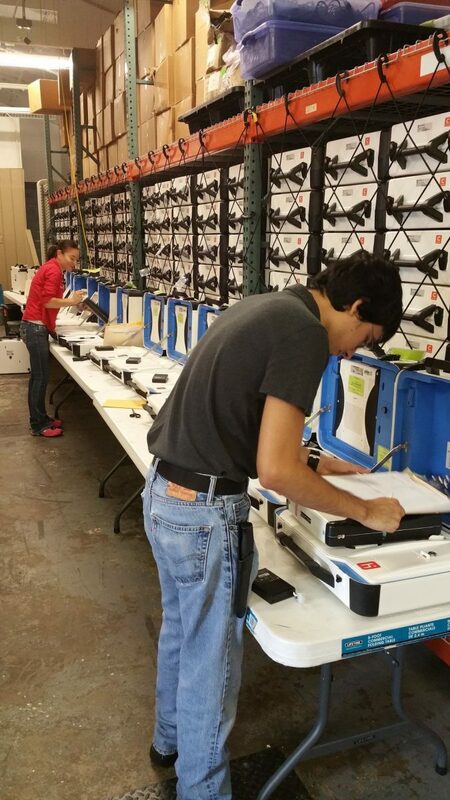 Hidalgo County elections staff tested about 450 Hart Verity machines for accuracy and logic Monday morning. Commissioners purchased more than 850 machines at the beginning of the year, but about half will be used during the upcoming November election. Candidates, city secretaries and members of the public took turns testing the machines at the election annex Monday. The new equipment, which cost the county about $5.4 million, has already been put to use at local schools. After each machine is tested, staff members place them in locked cages, where they will remain until the start of early voting. There will be at least six municipalities on the ballot Nov. 7, as well as proposed amendments to the Texas Constitution. “Oct. 10 is a very important date because it’s the last day that a person can register to vote or the last day a person can make changes,” Ramon reiterated.